1. 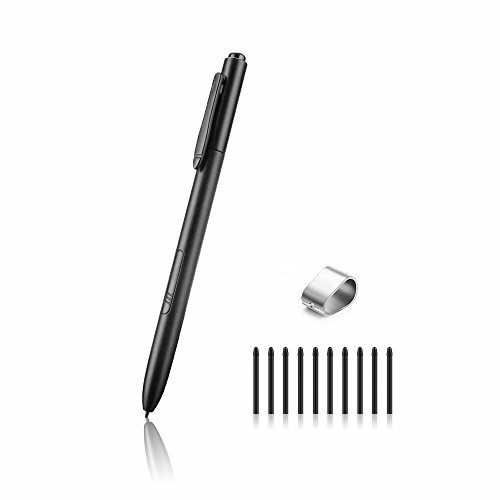 Cordless and Battery-free Digital pen ,not requiring charging or batteries . 2. 2048 Level Pressure .The pen has high sensitivity and identification rate,suitable for writing,drawing and other counts. 3. Plus or Minus 45 degrees Pen Tilt Angle ,left hand frienfly ,No matter left hand or right. hand people both can use the Pen very easily . 4. Compatible with the Parblo Graphic Monitor Coast10 . 5. Ergonomic Design, comfortably used as a mouse. When the tip of battery-free pen gets too short or develops a sharp edge, you can replace it with this kit. * Use the removal tool to pull the old tip straight out of the pen. * Insert a new pen tip into the stylus pen and push the tip until it stops. 1. Cordless and Battery-Free pen,you don't need to worry about the power capacity or battery leakage cause pen malfunction. Without a battery did reduce the weight of graphic pen. 2. Advanced Technical Features 2048 levels of touch pressure sensitivity makes the line smooth and natural and your controlling the thickness, transparency, and color of the line more conveniently and naturally. 4. Compatible with the Parblo Graphic Monitor Coast10 .comfortably used as a mouse.